Dr. Nicolette Borek is a clinical psychologist at the Center for Tobacco Products (CTP) at the Food and Drug Administration (FDA). AT CTP Dr. Borek leads a group of FDA scientists who work on a large study on tobacco use, attitudes and health called the Population Assessment of Tobacco and Health (PATH) Study. The PATH Study will include about 42,000 adults and 17,000 12-17 year olds from all over the U.S. looking at things like why people start using tobacco, what tobacco products people use, and how people quit. Prior to joining FDA, Dr. Borek worked at NIDA with research on children and teens exposed to nicotine and other drugs of abuse during their mom’s pregnancy. Dr. Borek also worked with youth and adults with substance use and mental health disorders. When not working, Nicolette likes to spend time with family and friends, do yoga, run, hike and bike, take pictures, and travel. Joining us now is Dr. Lori Ducharme, a NIDA sociologist, whose expertise is in the organization and management of addiction treatment services, including figuring out ways to get counselors and programs to increase their use of science-supported treatment practices. She was born in the north (Massachusetts), spent years working in the south (Georgia), and finds Washington DC to be an interesting cultural middle ground. Lori is an avid photographer, and when she’s not at work, she probably has a camera in her hand. She can’t wait for baseball season to get here. Dr. Joseph Frascella is joining the Chat. He heads up the division of NIDA that deals with a clinical program in neuroscience, human development, and behavioral treatment for drug abuse and addiction. He is a neuroscientist interested in how the brain works, and especially in how the brain is changed by addiction. When he is not thinking about brains, he works on his own addiction to studying and playing the guitar. Sheri Grabus is online helping our scientists. She is NIDA’s press officer and helps write materials for non-scientists. Sheri was trained as a neuroscientist and has also taught college courses in the field of psychology, including courses specific to drugs of abuse and their actions. Immediately prior to joining NIDA, Sheri ran a small-town Chamber of Commerce. When not at NIDA, she is busy playing with (and of course chasing and picking up after) her three young children. And sometimes she even gets time to go scuba diving with her husband, who is a jet pilot in the Navy. Joining us now is Dr. Marilyn Huestis—one of the world’s top drug abuse chemists! She also serves on the World Anti-doping Agency’s Prohibited Drug List Committee that determines the drugs that are not permitted in sports, and the Transportation Research Board and National Safety Council that work to reduce drunk and drugged driving. Her research focuses on cannabis or marijuana, MDMA or Ecstasy and in utero drug exposure (drugs taken by pregnant women). She monitors brain activities, cognitive performance and the physiological effects in people who use drugs. She has many years of experience as a forensic toxicologist performing post mortem and emergency toxicology (think CSI!). Dr. Huestis works to develop the science of toxicology in many countries around the world and loves to travel. She also loves skiing, tennis and teaching toxicology to University of Maryland graduate students. Jan Lipkin is a volunteer after retiring from NIDA where she served as deputy communications director for 15 years. She worked on many national health campaigns such as PEERx, the prescription drug abuse education project on NIDA’s teen web site. 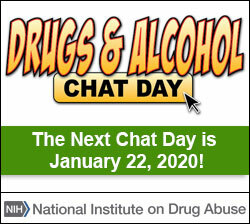 (Check out NIDA for Teens at www.teens.drugabuse.gov.) Ms. Lipkin plans to spend most of her time volunteering at the National Zoo here in Washington D.C., working with reptiles and great apes, like Bonnie the orangutan that she is using as her avatar. Dr. Lisa Onken is a psychologist and runs a program of research that supports the development of treatments for people with drug dependence and associated mental disorders, and the program has resulted in many new, effective psychosocial, behavioral, and medical treatments for drug addiction. She is married, and has two daughters, who are now high school grads. Lisa’s main hobbies involve food: reading cooking magazines, watching cooking shows, baking, and experimenting with new desserts. Her favorite television show is the “Daily Show,” her favorite music is rock’n roll (old & new). Get ready for more great answers to your questions from Dr. Harold Perl. Dr. Perl works with NIDA to help us understand better ways to prevent people from suffering with drug abuse problems and to help counselors and therapists learn how to use the latest and best techniques to help people. Harold went to high school in Queens, New York where his favorite subject was History. He received his Bachelor’s degree from the University of Rochester and his Masters/PhD from the University of Maryland. Harold has done a lot of amazing traveling including living in Jerusalem (Israel) and spending 3 months riding 13,000 miles on his motorcycle across the US and Canada. When not at work, Harold is an avid bicyclist and a double black diamond downhill skier. Dr. Elizabeth Robertson is an expert in human and family development with particular interest in how to help prevention practitioners use science-based intervention developed for specific age groups of children, their families, schools and communities. She is from the City of Presidents, Quincy , MA., but has lived in IL, VA, AL and NC, DC and MD for extended periods of time. She jokes that she is making a circle back up to MA. She lives in a quaint Victorian town in MD with 224 other home and her cat Bella Luna Dark Shadow Robertson. Luna helps her with all of her favorite pastimes of gardening, needlepoint, and various other crafts. Dr. Jeff Schulden is a psychiatrist whose work at NIDA supports research to understand trends in drug abuse in the U.S. and to understand what factors put people at risk for drug abuse and what factors protect them. Research areas of particular interest include the relationships between drug abuse and other psychological conditions, such as depression, and between drug abuse and other medical conditions, such as HIV infection. Outside of work, Jeff enjoys hiking, biking, and traveling, especially to our National Parks! This is Dr. Joel Sherrill’s third Chat. He is with the National Institute on Mental Health, so if you have any questions about depression, ADHD or other issues about your feelings and behaviors, he is your man! He is a clinical psychologist who has done counseling with adults and kids, but he has spent most of his time focused on research. After growing up in Michigan, and then going to school and working in New York and Pennsylvania, he moved to the DC area, where he spends a lot of time complaining about how hot it is in the South. Before he came to NIMH, he focused on using research to develop and test interventions to help children and adults with depression and other problems. Now at NIMH, he helps researchers who are doing this kind of work at universities and other research centers all over the country. When not in the office, Joel can be found hanging out with friends or just hanging out at home reading a book or watching too much TV. Dr. Belinda Sims is a developmental psychologist and works in NIDA's prevention research branch. At NIDA, she works with researchers from around the country who develop and test drug abuse prevention interventions for early childhood through the preteen years, including prenatal and infancy periods. Also, her research portfolio includes studies that look at how to get successful drug abuse prevention programs picked up and implemented in real word settings and systems like schools, communities, child welfare, health care, and others. She has one child who is a senior this year. She can’t wait for graduation day! Joining us is Isabelle Thibau, who will be assisting our experts. She graduated in 2011 with a degree in Chemistry and French. Isabelle greatly enjoys working at NIDA, which often involves “translating” information from Science to English. In her spare time, Isabelle loves to cook, research on health, study nutrition, enjoy wildlife, and watch the seasons change.